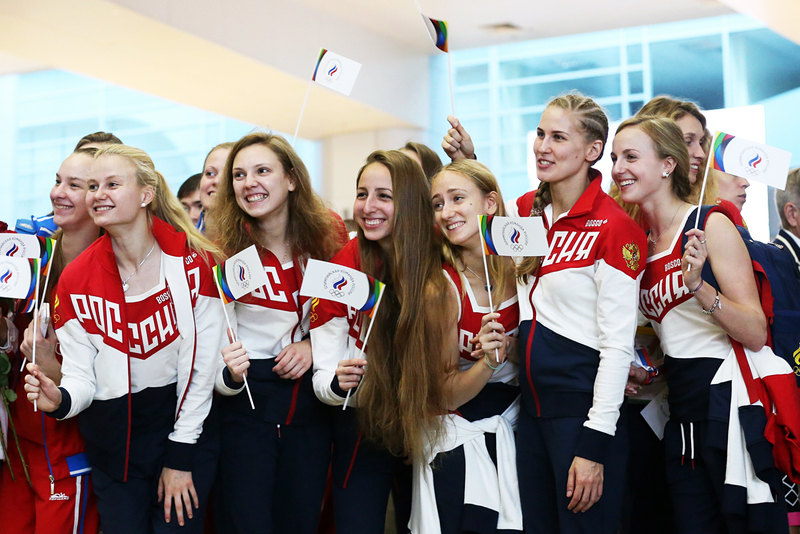 Anastasia Bayandina, Alexandra Patskevich, Svetlana Kolesnichenko, Elena Prokofyeva, Vlada Chigireva, Alla Shishkina and Maria Shurochkina (L-R), members of the Russian synchronized swimming team, at Sheremetyevo International Airport ahead of leaving for the 2016 Summer Olympic Games to be held in Rio de Janeiro, Brazil on August 5-21, 2016. 'We have zero tolerance to doping,' Alexander Zhukov says. No state-financed doping programs have ever existed in Russia. Russia’s team will be the cleanest at the upcoming Olympics in Brazil, President of the Russian Olympic Committee (ROC) Alexander Zhukov told reporters on July 28. "I can say only one thing: we have never had any state programs for doping support. We have zero tolerance to doping. Russia’s team is the cleanest one at Rio," he said. On July 18, WADA Independent Commission, chaired by Canadian sports law professor Richard McLaren, released a report on the results of its probe into the accusations of doping and manipulation of tests by Russian athletes and officials at the 2014 Sochi Winter Olympic Games. The report claimed that the system of covering up positive doping samples in Russia had been revealed in 643 cases in 30 sport disciplines from 2011 to 2015. The commission claimed it had found evidence that Russia’s Sports Ministry and the Center for the Training of Russian National Teams and the Federal Security Service (FSB) supported the doping program in Russian sports. On July 25, the International Olympic Committee (IOC) held a meeting of its executive board to discuss a possible blanket ban of Russian athletes from the Rio Olympics. The IOC executive committee decided not to ban the Russian team. Individual decisions on Russian athletes have been referred to relevant international federations. Apart from that, the IOC ruled than no Russian athlete who has ever been sanctioned for doping will be allowed to take part in the Rio Olympics, even if they have served the sanction. The 2016 Summer Olympic Games in Brazil’s Rio de Janeiro are scheduled for August 5-21.